"The cat is the mirror of his human's mind....the dog mirrors his human's physical appearance." I didn't get a chance yesterday to put the rest of my valentines up here.....and still won't get them all up tonight, either...but I will do what I can. So here I am with another of my variations on a theme valentines. This one is very similar to the last one I posted with inked embossing instead of double embossing. 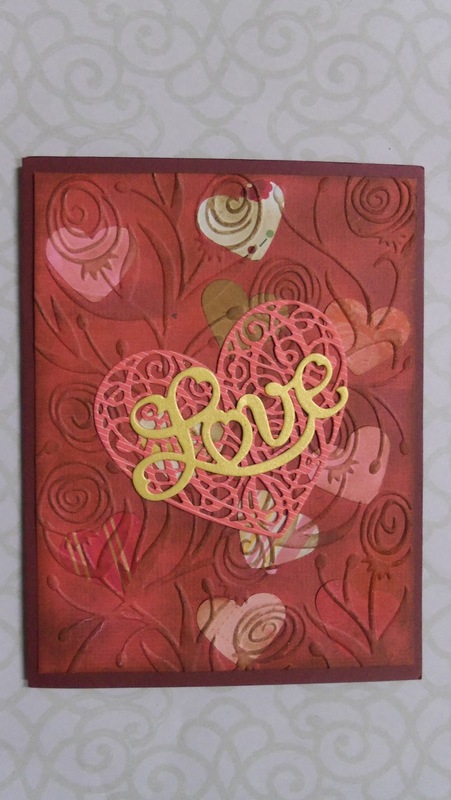 The colors on the lattice heart and the LOVE diecut are reversed and I didn't use any Glossy Accents. I still used my little punched hearts from scraps glued onto the background piece and ran it through with my Darice - Ranunculus embossing folder. This is fast becoming my favorite folder of the whole herd of these critters that are contentedly grazing in my craft area!! The flowers on this folder look like roses to me and are elegant enough to look formal, but also work with a more casual design. LOVE it!!! Here's a close up of the Serendipity lattice heart and Love die-cuts. I love the smoky look of this card from the Distress Ink (Fired Brick) that I used for inking. Yum. That's all for this post. I'll try to get at least one more valentine posted this evening. :) Hey, I still have my Christmas card making things out, so you didn't really think I'd be done with valentines this soon after Feb 14th, did you??!! Ha. ....and probably a couple more in a little while. I really love this embossing folder too and have never seen it before. As I look at your punched hearts combined with the embossing folder I realize that they look like handmade paper with hearts embedded as part of the paper surface. Kind of like the handmade papers that I have with dried flowers and leaves embedded in them. So many fun ways to use all of our goodies, aren't there? 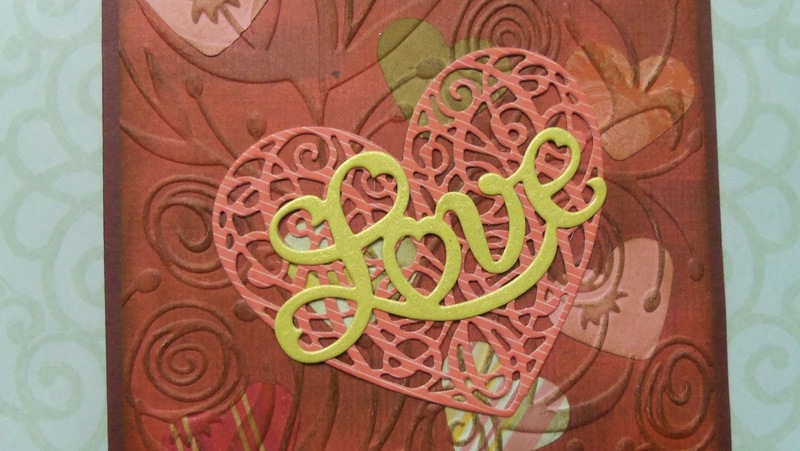 The combination of the lacy heart die and LOVE sentiment makes for an elegant design. 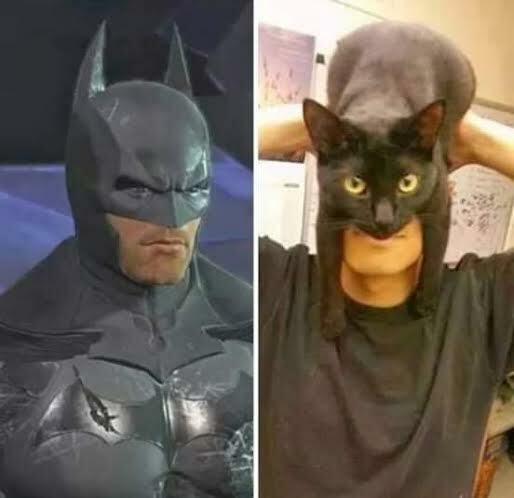 Oh, and that cat-Batman pose still has me laughing. It's especially funny in juxtaposition to this beautiful card! Another beautiful card. I like this folder and the Fired Brick ink you used. I am on a laptop so your photos are fine either way.